Editor’s Note: In response to my call for suggestions for manly crafts (and in response to a couple of reader emails-by crafts I wasn’t referring to stuff like carpentry and blacksmithing, which are of course quite manly-but to specific DIY projects that men could take on), Tom Pehrson wrote me a great article about building your own fitness equipment. 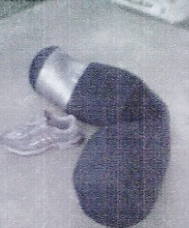 Tom lives in Alaska, reads AoM, and works out with fitness equipment he built himself. Now there’s a man. 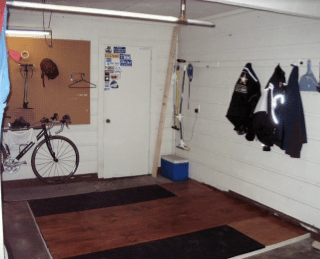 There’s nothing manlier that working out in your garage. 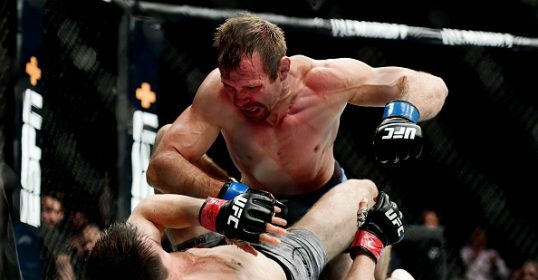 In fact, many men have relinquished their useless globo gym’s memberships and used that money to buy equipment for their own personal garage gyms. This saves time, and instead of paying some jerk’s expensive car payment, you keep the equipment. Get a good weight set, a bench, and hopefully a squat rack, and you’re halfway there. There are several other components to the home gym that make it even more functional and can help you take your fitness to the next level. Below are 8 pieces of equipment that will increase your manly strength and save you money in the long term. Nothing builds explosive strength like jumping on a plyo box. However, plyo boxes from most fitness distributors are extremely expensive. 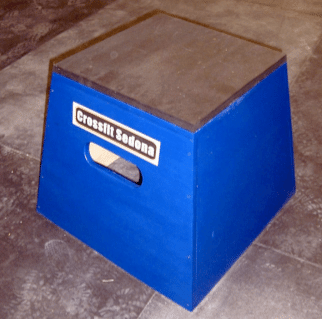 We’ve got some good instructions on how to make a 3-in-1 Plyometrics box here at Art of Manliness. Sandbags are an extremely versatile piece of equipment. You can do cleans, carries, snatches and strongman type loading with them. The best part is they cost next to nothing to make. All you need are an old duffel bag (preferably an army/navy rucksack), contractor’s bags, and some pea gravel. Double-bag the pea gravel in the contractor’s bags, and tape them up securely. Each smaller bag can be at the weight you think is prudent for loading. I have one large Navy sea bag and I made 5 different 25 pound small sandbags that fit into the large Navy bag so I can alter the weight as I see fit. 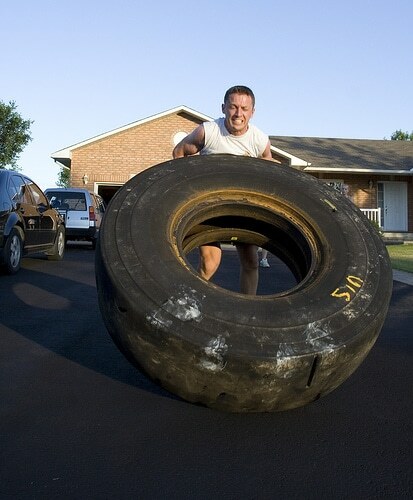 Another great exercise is to take your sandbag and some additional 45 pound plates and load up your trusty wheelbarrow. Quickly walk 100′, make a quick turn and head back to the starting point. Who needs shrugs when you got this exercise? If you’re a fan of the Olympic lifts (and who isn’t) you need a lifting platform. This is a handyman’s project and a little too complex to detail here. Here’s how to build a weightlifting platform. 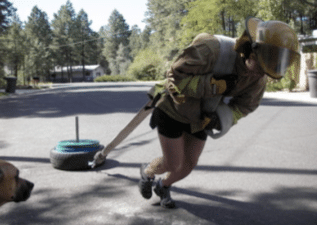 Pulling a sled is one of the best exercises for increasing work capacity and general physical preparedness. This piece of equipment will make good use of your welding skills. It requires a length of 1.25 square steel tubing (approx. 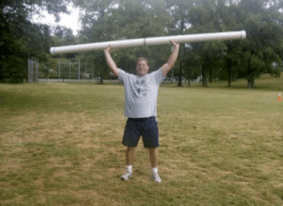 13″ long), an 18″x 24″ piece of steel, and a towing strap. First, take the 18″x24″ piece of 1/4″ thick sheet metal and bend a 2″ lip bent to 45 degrees at one end. Next, drill a hole through the lip for the tow rope. Then, take the tubing and cut (3) .25″ pieces off. These will be the spacers that the weight plates will sit on. Weld the piece of 12.25″ long tubing into the center of the flat steel surface. Finish the piece by welding the spacers equidistant from the pole in a circle so that your weight will sit on them in a stable manner. **This is a very manly sled, but if you don’ have a welder (or the skills) you can use the tow rope on a large tire and pull that around. 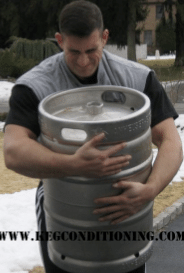 Kegs are another implement that we’ll use when doing strongman type exercises. 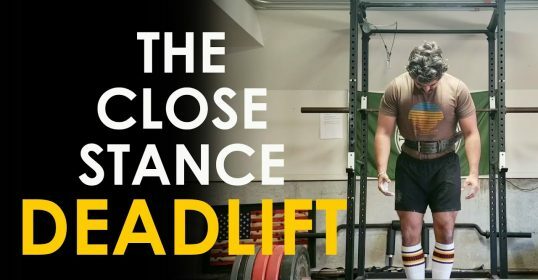 You can clean and press, distance carry, or do loading exercises with them. (Side note: loading exercises require the athlete to take a heavy object and place them on a surface that is head height or higher. The atlas stone is probably the most popular of these types of events.). Although you don’t construct anything, just having one of these around the house gives off an aura of manliness. Also, they’re usually F-R-E-E, but you’ll have to use your moving skills to transport it home. I got my tires from Les Schwab, but check any tire yard or heavy equipment shop and they’ll likely be more than happy to give you one. Both Even-esh and Elliot Hulse have their athletes flip tires on a regular basis. The prime exercise is flipping these beasts, but you can also attach your tow rope to the lip and use it for pulling as well. 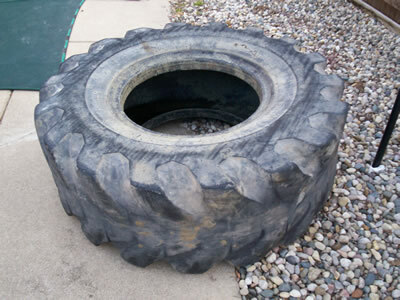 Additional exercises include the farmer’s carry (stand inside the tire, lift, and walk a predetermined distance) and glute-ham sit-ups (sitting on the tire with your feet inside the hole, hook your toes inside the lip and lean back to parallel and up again). Don’t let the easy design of this piece of equipment fool you. Work out with one of these and you’ll feel the abdominal equivalent of 100 crunches and 50 military presses. 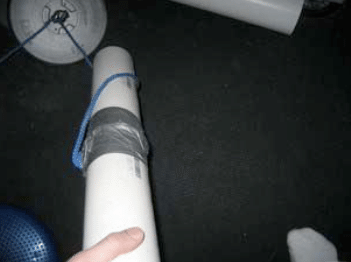 Take a 5 -7′ length of 2′ pvc pipe, fill it up to 2/3 with water, and cap the ends. You can do cleans & presses, overhead carries, drags or deadlifts with these for a very intense, short workout.